How has the start of your new year been? 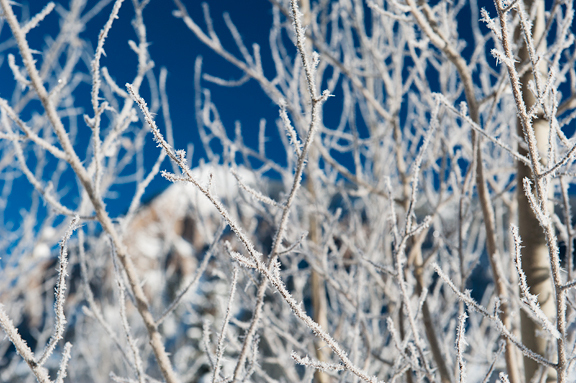 You can sum ours up in one word – COLD. I mean, we expect it to be cold in January around Colorado, but the first of the year put us in the deep freeze. We actually had to wait until afternoon before we could ski in temperatures above zero. But don’t cry for us! 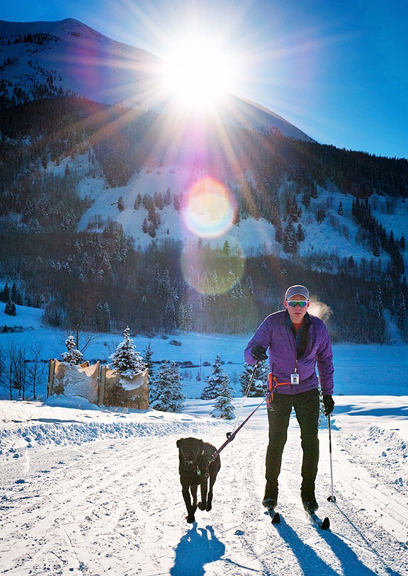 Cold in Crested Butte is not the same as cold in places like… the Midwest. These frigid temperatures occur when the skies are clear overnight, allowing any heat to radiate straight up toward the stars. That also means the sun is out full and bright in the morning, doing its job of warming us up into the single digits, providing happy rays, and basically making Colorado the awesome winter wonderland that it most definitely is. On the drive home to Nederland, Jeremy and I observed how Neva is improving (i.e. 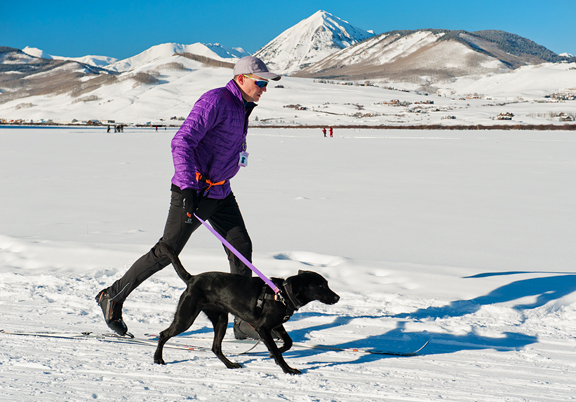 calming down) each day with house guests, ski touring, walks, and general every day behavior. She’s less of a spaz, although she is still very much a spaz. Our hope is if she can learn to stay with us on skis while leashed, she’ll naturally transition to trail running in the summer. “I can’t wait for summer,” I whispered. Jeremy gave me a look – the look that wonders “What have you done with Jen?” Oh sure, I love winter and I will relish every last snowflake this season! But last summer was ALL ABOUT PUPPY and itty bitty hikes. This next summer will be great big hikes, long trail runs, multi-day backpacks, and a very happy Neva. I also couldn’t wait to get home and stuff my face with vegetables. When we are in Crested Butte, the access to vegetables is somewhat limited compared to our usual array on the Front Range. That is especially true of Asian vegetables. I owe my vegetable addiction to my mom, who not only provided at least two vegetables with every dinner, but she prepared them in the most delicious ways possible. These days, Mom and I exchange vegetable recipes when we cook for one another. I usually introduce her to new western-style salads or preparations, and she is constantly surprising me with what she calls “old” Chinese recipes. How many treasures are locked up in her head? I’m doing my best to have her teach me when she’s here in the summers. 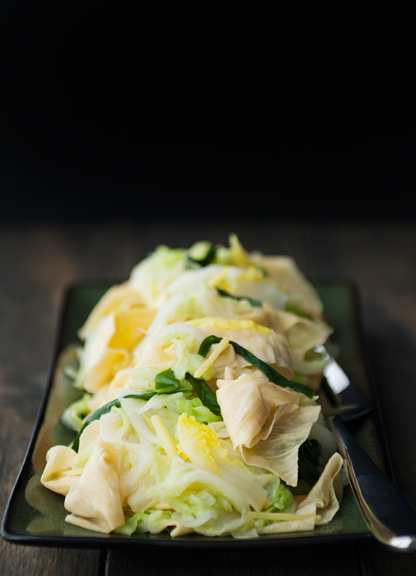 She taught me this napa cabbage recipe a few years back. Winter is the perfect time for its warm, comforting flavors. 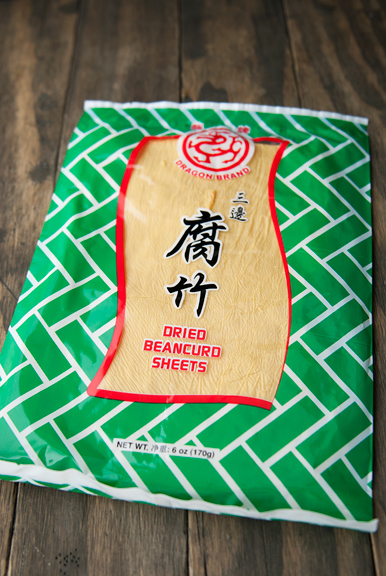 The only ingredient that you might have trouble finding would be the bean curd sheets. These are usually dried and found in dried food sections of Asian markets, but can sometimes be found in the frozen food sections. The sheets are thin and brittle, so don’t pack them under a watermelon or anything heavy. Start by soaking the fragile sheets in cold water. When they become pliable (a few minutes), drain the water off and feel around the edges for any really hard sections. Trim those off with kitchen scissors or a knife (scissors are easier here). Then cut the sheets into 2×4-inch pieces. Mom cuts the Napa cabbage leaves so that the leafy parts and the ribs are separate, then she slices the ribs into bite-size pieces. The reason for this is because the ribs require more time to cook through than the leafy parts. 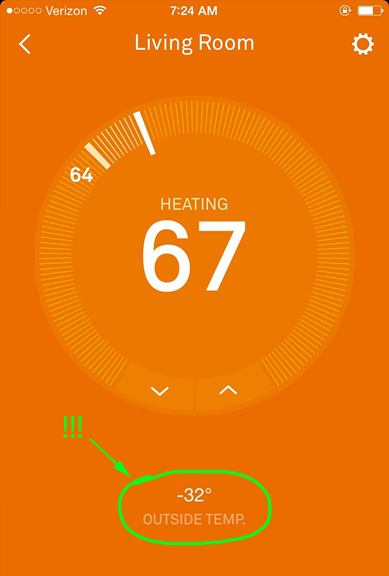 You don’t have to do this, but my mom reads my blog, so I’m playing it safe – ha ha! 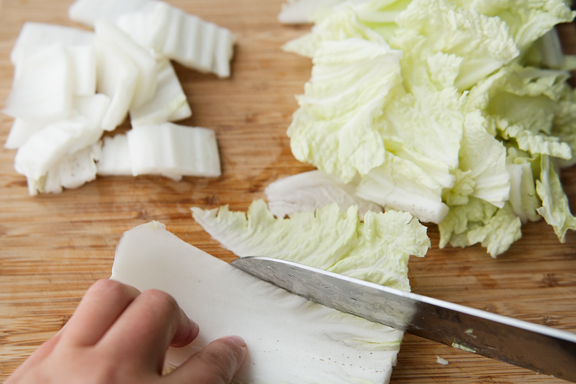 After the bean curd sheets and cabbage are cut, it’s a quick job to julienne the ginger and slice the green onions. If you want to make this dish vegetarian, use vegetable broth instead of chicken broth. 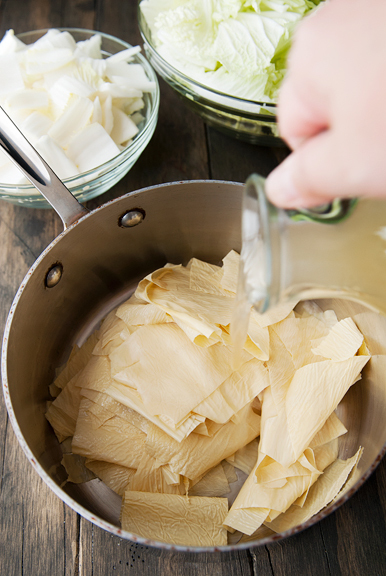 The first step is to simmer the bean curd sheets in half of the broth. During this process, they become delicate and tender. 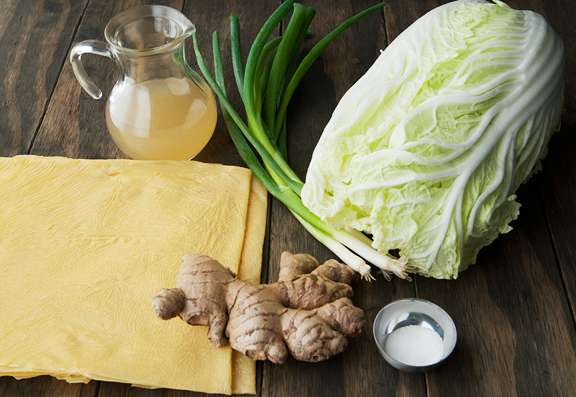 Set the bean curd aside and sauté the cabbage ribs with the aromatics. The cabbage ribs will eventually soften, but give it a few minutes. When the ribs are no longer hard, add the leafy bits to the mix and sauté. Finally, add the bean curd and the rest of the broth and let the whole thing simmer. What you get is a plate full of tender leaves and bean curd sheets punctuated with the occasional crunch of the cabbage ribs. Ginger adds a nice warming bite and brightness. It is quintessential winter fare, but this dish is great year-round. So don’t forget your vegetables! Although it’s hard to forget them when you crave vegetables that are this delicious. lovely, healthy, tasty – thanks, mom! 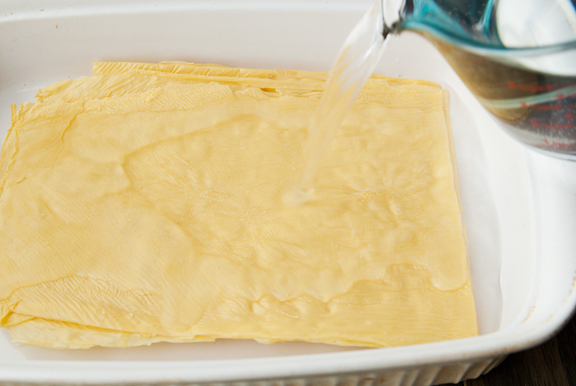 Soak the bean curd sheets in cold water until pliable. Drain the sheets and cut off any tough ends with scissors. Slice the sheets into 2×4-inch pieces. Set aside. Trim the cabbage leaves, separating the ribs from the leafy parts. Cut the ribs into 1×2-inch pieces and the leaves into 2-inch pieces. Place the bean curd sheets in a medium saucepan with 1/2 cup of chicken (or vegetable) broth over medium-high heat until the liquid begins to boil. 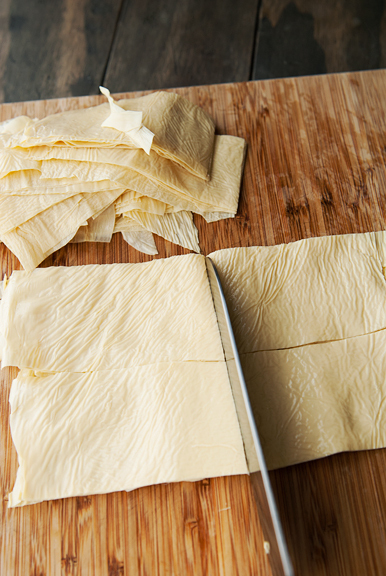 Reduce the heat and simmer the bean curd sheets for 6-7 minutes until tender. Set aside. 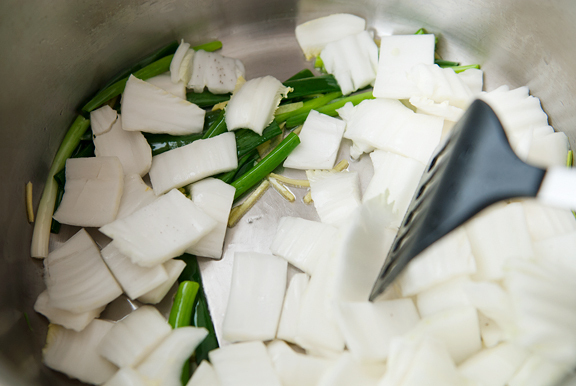 In a large sauté pan, heat the vegetable oil over medium-high heat. 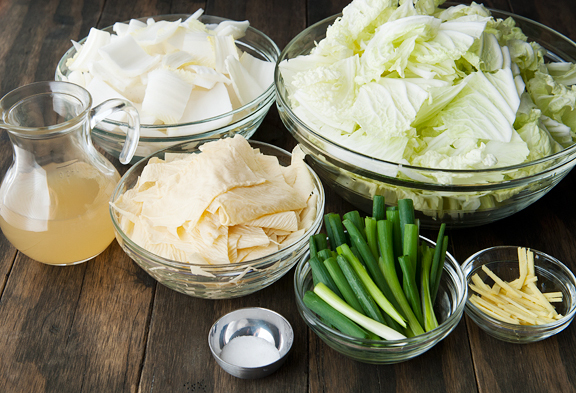 Add the green onions, ginger, the cabbage rib pieces, and a generous pinch of salt to the hot oil. Sauté for 2-3 minutes. 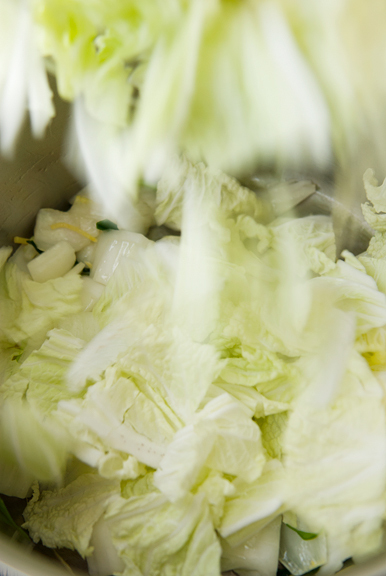 Add the cabbage leaves and another pinch of salt to the pan. Sauté another 2-3 minutes until the leaves are wilted. 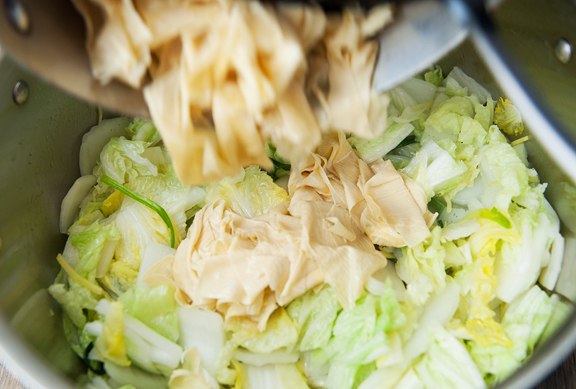 Stir the bean curd sheets and the remaining 1/2 cup of broth into the cabbage. Let the liquid come to a boil, then reduce to a simmer. Simmer for 3 minutes. Serve hot. Serves 2-4. This looks so yummy. Love a good (and new) vegetable dish. Heather – wow, I’ve never had it in soups! I’ll have to try that. 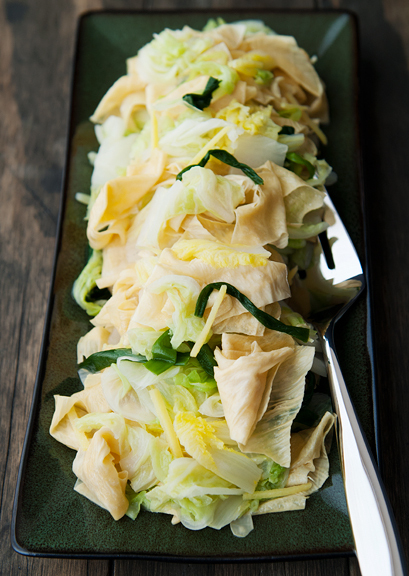 We also make vegetarian chicken with it (wrap up lots of sheets around bamboo shoots and mushrooms). So good!